William Powell accompanies Rob Loy, The Highland Rogue. Fiona asked if I could recommend a good book and I thrust Dashiell Hammett’s Red Harvest at her. She plodded through it, not quite convinced — “I’m mainly enjoying his descriptions of different shapes of mens’ heads,” — but then expressed greater interest in The Thin Man, which she consumed with the same alacrity Nick and Nora devote to booze. So then she wanted to watch the film. Weirdly, I always seem to be watching the second film in MGM’s series, AFTER THE THIN MAN, the one with Jimmy Stewart in, and never any of the others. I’m not sure I’d seen any of them all the way through. So now we’re doing the whole set. Note: easy to forget that the first two films are set and Christmas and New Year respectively, and follow straight on, one from one the other. Recommended light seasonal viewing if you want to avoid sentiment and saccharine. MGM had a habit of starting movies too early in the plot, it seems to me, but there are, I suppose, solid reasons for doing so with Hammett’s book. A good deal of set-up is needed, backloaded in the novel by having characters talking about what happened before Nick the Greek came on the scene. The movie introduces us to this business firsthand, which is good for audience comprehension but very bad for interest — waiting for Nick and Nora is like waiting for Groucho, and the movie only starts once they appear. The pleasures of William Powell and Myrna Loy’s interplay are well-attested. Powell in particular seizes any chance for a bit of interaction, and works his eyebrows like a slavemaster in his dealings with the supporting cast. Rather than Hammett’s somewhat hardboiled fellow who can drain oceans of liquor without visible effect, Powell relishes the chance to play drunk scenes. Loy isn’t that kind of show-off, so she comes across as the more efficient alcoholic, although Nora does get a hangover, something Nick somehow avoids. 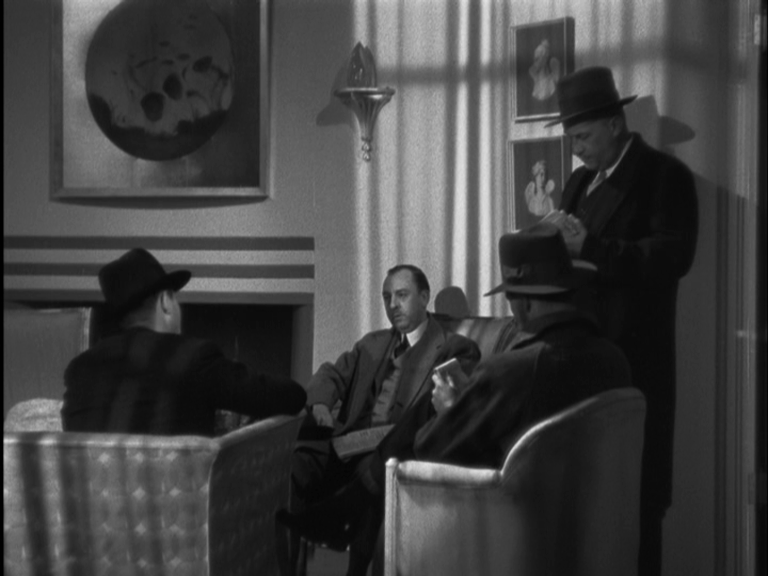 Cedric Gibbons and his team conjure gorgeous art deco interiors, not the world I picture in reading Hammett but very much a movie world I love to hang out in. (I’m an invisible spectre when I hang out in these movies, so the fact that I’m not in my tuxedo isn’t a problem.) Better yet, the first film is shot by the great James Wong Howe — it has wonderful compositions of people and rooms, and a certain added distance imparts a trace of bleakness. 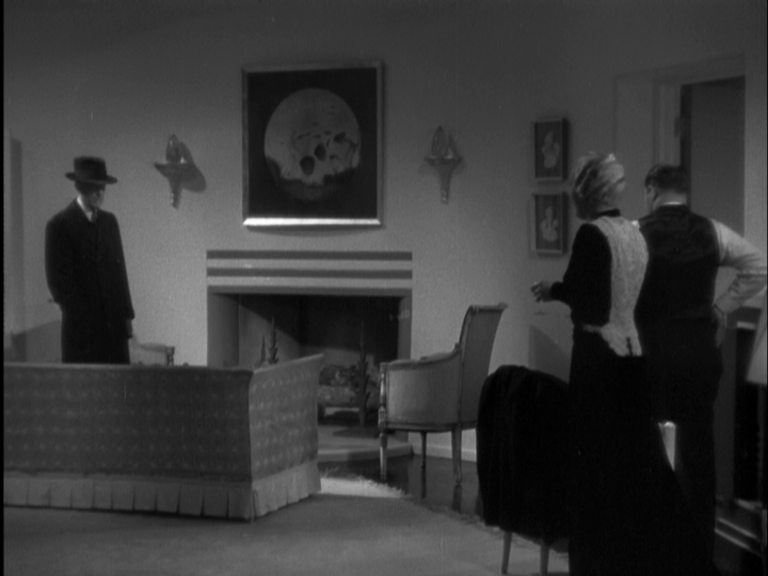 The lighting is source lighting in a noir vein, but since the rooms tend to be creamy white, the shadows get bleached out and the whole thing resembles a faintly sinister Heaven. Porter Hall’s glassy stare here clinches the odd mood. As late as the second sequel, screenwriters Frances Goodrich and Albert Hackett are still recycling the odd bit of leftover dialogue from Hammett’s original book, but the visual interest largely departs with Howe, although Dolly Tree keeps her end up with the splendid gowns. Van Dyke gets pretty sloppy, teleporting his cast about via the miracle of bad continuity, and the whole series is an odd mixture of “A” picture production values (with casts bristling with familiar faces) and “B” level ambitions, which I guess set in with any movie series. But throughout, the stars create perhaps the most enviable marriage in screen history. — perfect little pale boxes of people! This entry was posted on February 11, 2013 at 9:41 am and is filed under FILM, literature with tags After the Thin Man, Cedric Gibbons, Dashiell Hammett, Dolly Tree, James Stewart, James Wong Howe, Myrna Loy, Porter Hall, The Thin Man, Wiliam Powell. You can follow any responses to this entry through the RSS 2.0 feed. You can leave a response, or trackback from your own site. I wish all people acted like this. I love the sub-plot of the sires involving the inside of bet Nick and Nora have with one another over who can get to the next clue first. She always lets him take over for the grand finale but on the way there all sorts of fun ensues. My favorite moment (I forget from which film) is where Nick gets a tip about a night club. He rushes off there and the first thing he sees is a crowd of men around a table. He goes up to see what’s going on and there’s Nora with her cat-that-swallowed-the-canary smile. This is a world RULED by Myrna Loy’s ineffable fabulousness. The night club scene is from film 3, and is one of the highlights (there’s a great slip-slidey rhumba number there too). I saw this fabulous Myrna Loy dress last month (amongst many other wonderful things) at the V&A’s Hollywood Costume exhibition. Whoops – don’t know why that image didn’t appear. Let me try again. You seem to be missing the first half of the link. Even if the image doesn’t appear, a complete link will let us go there and see it. Which we are eager to do! I must volunteer for that blogathon — Fiona will insist. Perhaps the long introductory sequences could be compared to extended teasers in television episodes or more accurately the scene-setting in pilots (Twin Peaks springs to mind but the difference there is the world is more interesting). Rather more shakily perhaps it could be compared to Columbo openings (I could see Jack Cassidy from the Bochco-written Spielberg-directed Murder By The Book and other fine Columbos as a delightfully swinish villain in the Thin Man series). It’s closer to Columbo, I think. The practical need is simply to establish all the plot requirements dramatically, rather than have somebody explain them all to Nick Charles. But Powell is so entertaining I’d rather see him listening to it all, occasionally raising his eyebrows. And perhaps Asta (aka Skippy) looking from one speaker to another with rapt attention turning to boredom. That Asta was also in The Awful Truth and Bringing Up Baby (oh and Topper Takes a Trip, tho’ I always preferred the original and Topper Returns with Eddie “Rochester” Anderson and Joan Blondell) gives him a better track record than many humans. C’mon, Bringing Up Baby – irresistible. As an aside I’m aflicted with anality (so to speak, that sounds like it could turn nasty) so that all those films after After the Thin Man using the words “the Thin Man” as if they refer to Nick Charles *drives me nuts*! Ach, it’s not his nickname like the Saint, the Falcon, or the Lone Wolf it’s Nick *and* Nora anyway ya maroons I grumble madly…to no one. Heh. My mind appears to be broken. Oh, no you mentioned the Pink Panther! “But…but…the Pink Panther isn’t in these later films so why is it in the title?!”. Heh, I know it’s just a convention but being aspergic it drives me slightly nutty(-er) thankfully an enjoyable film trumps silly quibbles (The Thin Man Goes Home? No he doesn’t, unless he’s in a casket; Rambo III? Huh? there was no Rambo II?!). Titular ye not! (um, yes, that doesn’t make sense but I like Frankie Howerd…and puns. I think my brain is loose…) Such drivel of mine leads me to think of The Pink Panther Strikes Again, now the jewel may not actually be in it to do any striking again but that is my favourite of the Panther oevre, I’m not saying it’s the best (perhaps that’s A Shot In The Dark) just my favourite. Three scenes in particular stand out : Graham Stark as an old man asked if his dog bites by Clouseau, when told no the Inspector attempts to pat the mutt which reacts savagely, Clouseau after hurriedly withdrawing his hands chides the old man with “I thought you said your dog does not bite?” to which a pipe-smoking Stark replies “That…is not… My dog”. So stupid… And so funny. Secondly, there’s the grotesque masterpiece of a scene in which Clouseau is posing as an Einstein-haired dentist and must extract a tooth from the mouth of the now-lunatic Dreyfuss (the great Herbert Lom). Of course, it all goes wrong, he uses too much nitrous oxide pulls the wrong tooth and causes the make-up to melt droopingly from his face while both he and Dreyfuss are laughing maniacally, the frantically twitching, laughing Lom realizes who the idiot in his midst is and yells “Kill heem!”. Such comic hysteria, both too much and perfect. And there’s the climax where Clouseau’s tryst with the ravishing Lesley Ann Down is ruined by his similarly idiotic man servant (marvellous Mr Kwouk) -Cato crawling into the bed, Clouseau with a tie around his head, bubbles, psychedelic lighting, a love song playing over ridiculous goings-on, and the bed and occupants pitched into the Seine. Hilarious. I think I prefer A Shot in the Dark, and as I get older I find I like the first film best. As a kid, it seemed like the weakest because it had less Clouseau, but then I grew up and Claudia Cardinale kicked in. Claudia Cardinale! Bella! Definitely one of the best things about the original. I find that film lacks a certain energy though, it bogs down. That said, one really feels for poor idiotic Clouseau in it which isn’t the case in the later films which are purely *funny*, in Pink Panther he’s more human so it’s horses for courses really. One’s sympathies are for him at the end not lovely old David Niven or corned beef Jonathan Hart. A Shot in the Dark’s the funnier, slyer, better-constructed pure comedy, I think and, well, it’s got George Sanders in it. Strikes Again is a mess but I really like it above all. Only Sellers’s Clouseau could get away with calling Cato “My little yellow friend” and for it to be hilarious not offensive thanks to that accent and the fact that Clouseau is so innocently stupid that he has no idea that there’s anything racist (I don’t think he knows what racism *is*) or offensive about that phrase but what *sells* it is that Kwouk’s Cato doesn’t *care*, he doesn’t see anything *wrong* with it because hey, he gets to attack Clouseau as “training” – and of course when he thinks Clouseau is dead he takes over the rooms as a chinese restaurant (in the mediocre Revenge I think). Such bad taste but funny. 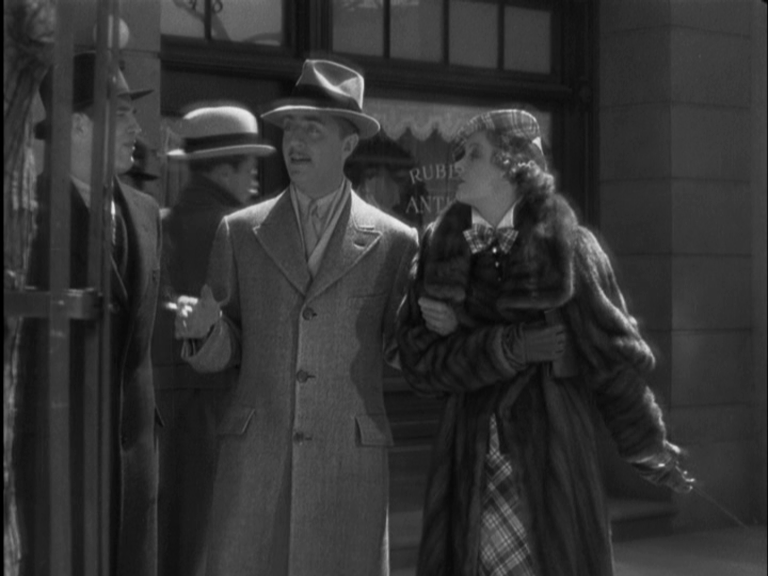 I’ve always like the first ‘Thin Man’ sequel, ‘After the Thin Man’, mainly because it’s set in San Francisco, which is pure Hammett territory. But I’ve also liked the script, and have suspected for years that Hammett had a hand in it. And now we can see, with the release from Mysterious Press of the book ‘Return of the Thin Man: the original screen stories’, that he did. The book presents, in prose form, Hammett’s work on the first two sequels, which screenwriters Goodrich and Hackett would fill out into a shooting script. And with few changes, they are pretty much how the final films turned out. I think that all involved in the production of this low budgeted series, were surprised at how popular it remained to be through out the years. With both Hammett and the screenwriters losing interest and dropping out of the series around the middle of it’s impressive run. New party game: who should play Nick and Nora in a remake? Wow, I had no idea! There’s a drop in quality between 2 and 3, but then a much steeper one for 4. I’m wondering if Richard Thorpe and Robert Riskin coming in for episode 5 will perk things up. We’re about to find out. Since Powell is probably a bit more debonair, a bit less tough and a lot less Greek than Hammett’s NC, I wonder if it would be a good idea to correct that in any remake? Certainly competing on the same ground as Powell and Loy seems doomed to failure, as Hart to Hart discovered. Telly Savalas would have been good.